- Did the Oilers win the Larsson/Hall trade? Is Penguins/Capitals the best second-round matchup ever? The Washington Capitals will face the Pittsburgh Penguins in the second round of the playoffs, and hockey fans have some mixed feelings about the matchup. On the one hand, it should make for a fantastic series, one that pits the regular season's two best teams against each other. But on the other, something seems off about a playoff format that serves up a matchup like this in the second round, while also giving us a Senators/Rangers series featuring two teams who finished well behind. Let's put the playoff format debate aside for today, and focus on the positive: We may be about to see one of the best second-round matchups in NHL history. That's a tougher list to put together than you might think, since the NHL has a long history of odd playoff formats. For the Original Six era, of course, the "second round" was the Stanley Cup final, so that doesn't really seem to fit what we're looking for. And for most of the 1970s, there was a best-of-three preliminary round that nobody was sure actually counted. You could take your pick of four different Oilers/Flames matchups between 1983 and 1988; this is probably the greatest second-round rivalry in NHL history (although Canadiens/Nordiques might have something to say there). We'll go with the last of the group, since by 1988 it had been clearly established that the Battle of Alberta was the unofficial Stanley Cup final. The matchup: The Oilers had won three of the last four Cups and had put up 99 points. But the Flames won the division (and the Presidents' Trophy) with a 105-point campaign. The series featured two of the league's three best regular season records. The series: Ironically, the best of the Flames/Oilers matchups on paper produced the worst series. While their 1984 and 1986 matchups were both seven-game classics and gave us one of the most memorable moments of the decade, this one was a bust. While all the games were reasonably close, the Oilers swept the Flames aside in four games en route to one of the most impressive Stanley Cup runs ever -- they lost just two games in the entire playoffs. Welcome to Round 2 of the NHL playoffs. It arrived a bit early, since the hockey gods cruelly deprived us of so much as a single Game 7 in the opening round, but we're happy to have it anyway. The action gets underway tonight with the Western Conference, and tomorrow night with the Eastern Conference. And the previewing gets underway right now. For years, the Western Conference has been the NHL's better half. That wasn't the case this year, and with the conference's two best teams in terms of regular season points already done, the path to the final is wide open. In this corner: The Ducks (46-23-13, 105 points, +23 goals differential not counting shootouts), who should be well-rested after sweeping aside the Flames in four games. And in this corner: The Oilers (47-26-9, 103 points, +36), making their first postseason appearance since 2006. They went all the way to the final that year, in case you were wondering. Head-to-head: The Oilers won three of five. Dominant narrative: The up-and-coming Oilers face a veteran team whose window may be closing. If that sounds familiar, it was pretty much the same story line we had in the San Jose series. The Ducks' situation isn't quite as urgent as the Sharks', but it's not far off, thanks to an aging core that's locked into some long-term deals. It's not quite "now or never" in Anaheim, but in theory they should have a sense of urgency that the young Oilers may not be able to match. Injury report: The Oilers are relatively healthy. The Ducks have been missing two key defensemen in Cam Fowler and Sami Vatanen, but it sounds like both men might be back for Game 1, which would be huge. The big question: Does momentum matter in the playoffs? If so, the Oilers could be in trouble, because the Ducks have been just about unstoppable lately. They've won eight straight going back to the regular season, and haven't lost in regulation since March 10. One player to watch: Ryan Kesler. The Ducks went out and traded for Kesler three years ago (and gave him a big extension that lots of us questioned) for exactly this sort of scenario. He'll be tasked with shutting down Connor McDavid, or at least with preventing him from single-handedly winning the series. It's no easy task, but Kesler earned a Selke nomination for his defensive work this year, and he's been around long enough to know how to target the other team's star. McDavid had four points in the first round, which would be fine for most players but was a disappointment for him. If Kesler can limit him early, frustration could set in. Key number: 79. That's how many games Edmonton's Cam Talbot has started so far this season, including a league-leading 73 during the regular season. That's well above his previous career high of 53, and this is his first playoff run as a starter. Does he wear down eventually? He was very good against the Sharks with the exception of a Game 4 meltdown in which he gave up five goals on the way to a 7-0 loss. Bonus prediction that is oddly specific: At some point, Kesler does something to McDavid that leads to Milan Lucic making a show of wanting to fight him. In the sports world, there's nothing sadder than seeing someone struggle at the one thing that they used to be the best in the world at. Michael Jordan clanging jumpers in a Wizards uniform. Tiger Woods limping his way to missed cuts. Brett Favre throwing pick-sixes for the Vikings. It can be uncomfortable to watch, bordering on outright tragic. So you can be forgiven for wanting to avert your eyes at the sight of Toronto Maple Leafs fans this week, because we're failing badly at the one thing you could always count on us for: Being miserable. This is supposed to be our thing. Other fans do parades and celebrations and enjoy happiness and hope. Not us. We watch our team lose, we internalize it, and we suffer. We remember the worst moments forever; they're scarred directly into our identity as fans. Kerry Fraser. Jeremy Roenick. It was 4-1. This is what we do. Often publicly, often in uncomfortably over-the-top ways, and almost always with the rest of the hockey world pointing and laughing. This week, we watched the Maple Leafs lose a playoff series that they absolutely could have won. They had a 2-1 series lead, five of the games went into overtime, and all the underlying numbers were essentially equal. The series was there for the taking. But the Leafs lost, in six games to the Washington Capitals, and now their season is over. And as Maple Leafs fans, we're... kind of fine with it, actually. I know that comes as a disappointment to a lot of you out there. For fans of other teams, watching Leafs fans be miserable has pretty much become an end-of-season tradition. It's almost therapeutic, because you know that no matter how bad things get with your own team, at least you're not us. And let's be honest, some portions of the Toronto fan base could stand to be knocked down a peg or two. The tears of Toronto Maple Leafs fans water the tree of hockey liberty, or something like that. But not this year. There's not much misery to be found around Leafs Nation. We're doing good, thanks for asking. That's not to say that we're happy about the Leafs' first-round loss. Obviously, an upset win over the Capitals would have been something special, right up there some of the most memorable Maple Leaf wins of a generation. They might have even given the Penguins a run for their money. Heck, maybe they could have gone on a deep run, bringing back memories of the 1992-93 Leafs team that Toronto fans will never shut up about. But it didn't happen. Marcus Johansson silenced a Toronto crowd with Sunday night's OT winner, and the Leafs season is over. One more lost playoff series to throw on the pile. Yet another year without a Stanley Cup. So where's all the misery? - Does the way the stick-slashing rule is called make sense? With the playoffs in full swing, it’s easy to forget about the 14 teams who’ve already cleared out their lockers and headed out to the cottage for summer vacation. That’s the nature of the NHL — once the playoffs arrive, you’re either still alive or you barely matter. But today, let’s offer up some encouragement to those 14 teams who weren’t invited to the post-season dance. And we’ll do it using the 16 who were. For each of the outsiders, let’s pick out one problem the team is facing – in some cases we’ll have plenty to choose from – and then see if we can find some hope in one of this year’s playoff teams. The issue: They’re not sure if they can trust their young goaltender. Connor Hellebuyck was supposed to be the real deal. He had the pedigree, the resumé and a decent rookie season in 2015–16. But this year, his first as a starter, he wasn’t very good, and now the Jets may be wondering how much faith they should have in the 23-year-old. But just look at: The St. Louis Blues. Hellebuyck may have struggled this year, but things never got as bad as they did for Jake Allen, whose struggles were bad enough to get his coach fired and who was even left at home during a road trip. Was he able to rebound? Ask the Wild. Goaltending is voodoo and you never really know what you have in anyone, especially younger players. But Allen is a good reminder for Hellebuyck fans that a shaky few months aren't necessarily anything to panic over. The issue: They tore it all down. They followed all the steps in the rebuild recipe. But so far, the results just haven't been there, and patience is starting to wear thin. But just look at: The Edmonton Oilers. No rebuilding team has spun their wheels for longer than the Oilers. But this was the year that the big step forward finally, mercifully arrived. It could happen in Buffalo, too. Sure, a lot of Edmonton's success has to do with winning the Connor McDavid lottery, and we know that's still a bit of a sore spot in Buffalo. But while the Sabres may not have a McDavid, they do have Jack Eichel, and like McDavid was this year, he'll head into camp looking to rebound from a season disrupted by injury. The Sabres really do look a lot like the Oilers did at this time last year – a great young core up front, good if somewhat unproven goaltending, questions on the blue line. They've got a way to go and there are no guarantees, but an Oiler-like turnaround doesn't seem out of the question. Update: On Thursday Buffalo fired GM Tim Murray and head coach Dan Blysma. The issue: A disappointing season cost a well-respected coach his job. But instead of a fresh voice, they just brought back somebody who'd already coached them years ago. Sure, that guy won the franchise's only Stanley Cup, but can you really get anywhere by chasing past glories? But just look at: The Anaheim Ducks. There's a bit bigger gap between Ken Hitchcock's championship in Dallas and Randy Carlyle's in Anaheim, but otherwise the similarities are hard to ignore. And while Carlyle's hiring raised a few eyebrows last summer, so far it's led to a division title and a trip to the second round. It's NHL playoff time, which means one of two things: Either your favorite team didn't make it, or your favorite team is going to lose. That sounds depressing, but it's reality. Every team that makes the playoffs is going to have to get used to losing. There's a 15 out of 16 chance that your team is going to get eliminated, and even if they win the Stanley Cup, they're still going to lose at least a few games along the way. And that's going to be painful, because playoff losses are the worst. A fan can shake off a typical mid-November loss within minutes, because the NHL regular season drags on forever. But playoff losses can ruin your night, the next day, and well beyond. And worst of all, not all playoff losses are created equal. So today, let's look at five common types of ways your favorite team can lose a post-season game, and how a typical fan ends up dealing with them. The game: Your team plays great, certainly well enough to win if there were any justice. They're all over their opponents, controlling play, generating chances and firing shots from everywhere on the ice. But nothing goes in, because the other team's goalie turns into late-90s Dominik Hasek. The reaction: At first, you're reasonably OK with this one. Hey, it happens, right? Sometimes a goalie just has one of those nights, and there's not much you can do with it. That's hockey. The key is that your team played well, and as long as they keep that up, they'll win more than they lose and everything will be OK. But after that initial acceptance, the tide starts to turn. Was the other guy really that good, or did your team just make him look that way? On closer inspection, a lot of those highlight reel saves sure look like your guys just shooting the puck right into a waiting pad or glove. What are we paying all these high-priced forwards to do? And hey, what about your own team's goalie – would it kill him to steal a game or two every once in a while? Fun fact: No matter how good their own goaltending is, every NHL fan is convinced that at least 80 percent of these games go against their team. The game: It's a close one that could go either way. And then, it happens – somebody screws up. Maybe it's a lazy clearing attempt. Maybe somebody misreads a coverage. Maybe they take a bad penalty (the puck-over-glass rule figures prominently in this category). Or maybe it's just one of those fluke plays, like somebody blowing a tire or accidentally kicking a puck into their own net. Sometimes, you may not even spot the mistake in real-time; it won't be until the fifth slow-motion replay that you realize what just happened. But one way or another, sixty minutes or more of hockey ends up crystalizing in one regrettable play. The reaction: This is one of the toughest losses to deal with because it leaves you with a focal point, that one moment to roll over in your mind again and again over the next day or two. Eventually, your brain starts coming up with alternate realities where the play never happens, and your team ends up winning. Last Thursday, we marked the Toronto Maple Leafs‘ return to the playoffs with a post on the team’s 10 best playoff games of the last 30 years. It was a simpler time, back before we’d been through multiple overtimes and when we still assumed the Capitals would roll past the Leafs easily. We didn’t even know who Dart Guy was. Look at us back then, we were so young. Well, fair’s fair, so today we’ll visit the other end of the spectrum, with a ranking of the 10 worst Leafs playoff games of the last three decades. There’s one important note to keep in mind, though. Ranking a team’s best games is a relatively straightforward exercise. Most playoff runs end in misery eventually, so you just take the games that you enjoyed most as a fan at the time, and there’s your list – with few exceptions, the best games generally hold up well. But bad games are a little bit trickier, since sometimes you don't know just how miserable a game will make you feel down the line. An especially tough playoff loss is like a slow-acting poison, and you don't feel its full effects until years later. Hindsight is going to play a big role today, especially as we get near the top of the list. But let's start our countdown a little more than 27 years ago, from a spot just outside the Maple Leafs' blue line. The 1989–90 Leafs team was their best in a decade. That's not an especially high bar, and the team still only finished .500, but they ranked third in the league in goals scored and seemed as if they might finally be building something resembling a winner. But after dropping a pair of 4–2 decisions in St. Louis, the Leafs headed back to Toronto facing a must-win in game three. They fell behind 5–3 in the third, but fought back to force overtime with two late goals that had the Gardens crowd roaring. An overtime win could have been the sort of clutch comeback that turns a series. Instead, Sergio Momesso went five-hole on Allan Bester from outside the blue line. The Blues closed it out in five games, the 1990–91 season turned out to be one of the worst in team history, and the Leafs wouldn't make it back to the playoffs until 1993. Momesso later played for the Leafs, but nobody ever forgave him for this goal. The Leafs' 1998–99 season had already included a 28-point improvement, the first playoff appearance in three years, two series wins, and one Markov salute. Now they headed to the conference final with momentum, home ice and a winnable matchup against the seventh-seeded Sabres. There was just one problem, and it was the same problem every Sabres opponent faced in those days: the best goaltender in the world. Dominik Hasek had just won back-to-back Hart Trophies, not to mention single-handedly winning Olympic gold. At that point, he was the scariest player in hockey. And then, hours before game one, a playoff miracle (for Leafs' fans, anyway): Hasek was hurt, and the Leafs would be facing backup Dwayne Roloson instead. It was the perfect opportunity to jump out to an easy lead in the series. And sure enough, Roloson struggled, allowing four goals. But Curtis Joseph gave up five, and the Sabres stole the opener without their best player. The Leafs took game two, but Hasek returned for game three and shut them down the rest of the way. The Leafs never seemed to recover from the missed opportunity in the opener, and their third conference finals appearance of the decade ended in five games. Five days into the NHL playoffs, and here’s the good news: Everyone is still in. Not a single team has been eliminated. Everyone still has hope. Well, except for you, Blue Jackets and Wild. You’re basically already out. Sure, none of the series have played more than three games, and the analytics guys we hired to crunch the numbers tell me it’s not possible to lose four games before Game 4 has even arrived. But you can lose three, and NHL history tells us that being down 3-0 means it’s basically over. Two teams face that scenario today thanks to losses on Sunday. Minnesota dropped a third straight close one to the Blues, while the Blue Jackets lost a heartbreaker at home when Jake Guentzel snuck an overtime winner home to silence the Columbus crowd. For both teams, an early exit would make for a devastating ending to an unexpectedly excellent season. Both spent time on top of their respective conferences, and both went into the playoffs as legitimate Cup contenders. Now, both are wondering if they can so much as win a game. The Blue Jackets can at least point to a brutally tough matchup with the defending champs, as the league's playoff format matched two of the league's top four regular-season teams in Round 1. John Tortorella and his team were going to need to go through Pittsburgh eventually. But a better matchup would have been a welcomed boost for a team that's never won a round, and now doesn't look like they'll snap that streak this year. The Wild can't even play the matchup card; they went into their series with home ice and as heavy favourites over the Blues, a team that the oddsmakers had installed as the playoffs' biggest underdog in terms of overall Stanley Cup chances. St. Louis is making that look like a bad call, riding some timely scoring and Jake Allen's sudden transformation into late-90s Dominik Hasek. Bruce Boudreau defended his team after the game, insisting that they were "friggin' good," but it's becoming apparent they'll need to be much more than that, and soon. So can either team pull off the comeback? In theory, the NHL's age of parity should make 3-0 comebacks more common; if every game is close to a coin flip, you'd expect to see a team come all the way back a little more than once every 10 opportunities. The Kings managed it three years ago and the Flyers did it back in 2010, so let's not go and slam any coffin lids shut quite yet. But it's close, and the Wild and Blue Jackets know it. Columbus gets the first chance to stave off elimination Tuesday, while Minnesota has to wait for Wednesday. Meanwhile, the Flames and Blackhawks will try to avoid 3-0 deficits of their own Monday night. During the regular season, this is the part where we ranked the league's teams in our weekly top five/bottom five power rankings. Now that the playoffs are here, that format only takes us so far – we're going to start running out of teams before long. So instead, we'll broaden the approach and open our power rankings up to just about anything – teams, players, coaches, fans and even narratives. Celebrating the players, teams, storylines and themes that have had the best week. 5. Overtime: Last year's first round was disturbingly overtime-deprived; there were just seven OT games through the eight matchups. We got more as the post-season went on, finishing with 20 overtime games in total. But that wasn't enough, because when it comes to playoff overtime, it's never enough. This year, the hockey gods haven't made us wait. We've had seven overtime games already, covering six of the eight series. The Leafs and Caps have already played two, and we've had at least one sudden death game on every day of the playoffs. The only thing missing so far is the marathon game that goes three or four extra periods. But you knew that couldn't happen on a long weekend where lots of fans don’t have to work the next day. That would be too easy. That one's coming on some random Tuesday night, where it can wipe a day's productivity out of the Canadian economy. And it will be worth it. The Maple Leafs are back in the playoffs. For the first time since 2013 – and the first time in a full season since 2004 – the Leafs will take the ice for postseason action Thursdat night in Washington. And they'll do it with one of the youngest and most exciting rosters in the league, a team that looks like it's been built for sustained long-term success. For the first time in a generation, there's finally a reason for Toronto Maple Leaf fans to be happy. And if you're not a Leafs fan, you're already sick of it. I get it. I'm well into my fourth decade as a diehard Maple Leafs fan, but I recognize that collectively, we're not always the easiest bunch to deal with. Occasionally, we need to be knocked down a peg or two. But like all good things in life, making Maple Leaf fans sad has to be done responsibly. You can't just belch out some half-formed insult and then look around for high-fives. There's an art to bothering Leaf fans, and if you don't put some effort into, you're just making the problem worse. I'm here to help you, fan of one of the other 29 teams. Today, I present you with five key tips for dealing with the Maple Leaf fans in your life. If you're going to insult a Maple Leafs fans, don't overthink. Just go with the classic: "1967". The Leafs haven't won a Stanley Cup in 50 years and counting, and we all know it. There's really no great comeback for a Leaf fan faced with a good 1967 bomb. It's simple, straightforward, and reasonably effective. And no, you can't get around that qualification by dropping an "At least we made the final" on us. That's a bad idea, for two reason. First, nobody cares that your team made it the final and then lost. Good for you, so did the 1996 Florida Panthers. But more importantly, you have to think strategically here. At some point in the future, the Maple Leafs might make it to the final, come within a few games of ending their Cup drought, and then lose. That's going to be a prime opportunity to really twist the knife on devastated Leaf fans. But it won't work if you've spent years pretending that just coming close is a consolation prize worth celebrating. Think long term here. The NHL playoffs start tonight, which means we've got only a few hours left to break down each series and get our predictions on the record, followed by a few weeks of regretting each and every one of them. As always, please remember that prior to the season I picked the Stars and the Lightning for the Stanley Cup Final, and you should not listen to anything I tell you is going to happen. On Monday, we broke down the Eastern Conference, and I already cravenly backtracked on one of my picks during the podcast. Today, let's move out West. The Central ceded its status as the league's toughest division to the Metro this year, but it's still very good. As always, the Blackhawks are the team to beat, but for the first time in four years, they'll actually be starting at home. In this corner: The Blackhawks (50-23-9, 109 points, +28 goals differential not counting shootouts), who locked up the top seed with weeks to play and then cruised down the stretch. And in this corner: The Predators (41-29-12, 94 points, +18), a preseason Cup favorite that stumbled through much of the first half before eventually getting on track. Head-to-head: The Blackhawks took four of five. Dominant narrative: The closest thing to a dynasty we've seen during the cap era takes aim at their fourth Stanley Cup. It's hard to overstate how impressive Chicago's run on top of the NHL has been in a league where the salary cap is supposed to drag teams back to the pack. Now they head into the playoffs as the clear favorite out West but draw a deceivingly tough matchup with Nashville. Injury report: Everyone is banged up this time of year, but all the big names in Chicago sound reasonably healthy for Game One. Nashville is in rougher shape with several players potentially on the sidelines; key defenseman Roman Josi is hobbled but should play. The big question: Can anyone beat the Blackhawks? Hey, it's already out there. It plays into the narrative all sports fans secretly love, that of the near-invincible favorite waiting for just the right underdog to show up and shock the world. So here's a spoiler: Yes, of course someone can beat the Hawks. In today's NHL, anybody can beat anybody else, even in a seven-game series. Chances are, somebody will beat Chicago over the next two months. Can it be Nashville? It sure can. Will it? Uh, let me get back to you on that one. One player to watch: P.K. Subban. If you're a sports fan, you should always be watching Subban, just because. But he's also a guy with a history of having big playoff moments, and he loves the spotlight. Remember his "I can't wait to take it all away from them" quote about the Bruins a few years ago? Let's see how he feels about facing the league's marquee team. Key number: 77.7 percent. That's Chicago's penalty kill rate, the worst among the 16 playoff teams, and you'll hear about it plenty over the coming days. As others have pointed out, that stat is a bit misleading because of how badly the Hawks started. You can't totally hand-wave away a team's worst stretches, but Chicago isn't in as much special teams trouble as you might think. Bonus prediction that is oddly specific: Subban gets an overtime goal in the series. The NHL's regular season is over, which means that the very best time of the year has arrived. That's right—no more shootouts, and the loser point is dead until October! Oh, it also means the playoffs are here, if you're into that. Round One gets started on Wednesday, which gives us a few days to break down the matchups, crunch the numbers, and make some predictions that we'll be forced to delete in embarrassment within two weeks. Today, we'll start with the four Eastern Conference matchups. We'll be back later in the week with the West. This was the league's best division all season long, thanks to the presence of four powerhouse teams. Now it's the playoffs, which means it suddenly has three powerhouse teams and one underdog from the Atlantic, because the NHL's playoff format is weird. In this corner: The Capitals (55-19-8, 118 points, +84 goals differential not counting shootouts), the winners of the Presidents' Trophy for best regular-season record for the second straight year. And in this corner: The Maple Leafs (40-27-15, 95 points, +16), who made the unlikely leap from dead last to the playoffs in a single season. Head-to-head: The Capitals took two of three, including a 4-1 win last week. Dominant narrative: The plucky band of bright-eyed kids versus the powerhouse that should crush them. It's hard to overstate just how good the Maple Leafs rookie class was—it may be in the discussion for the very best the league has ever seen. Auston Matthews, Mitch Marner, and Willie Nylander get the attention, but there are first-year players up and down the roster. That makes the Leafs' playoff appearance all the more remarkable. It should also make them easy fodder for a deep, experienced, and very good Capitals team. Injury report: The Capitals were without John Carlson for the last three games, although it sounds like he should be back for Game One. The Maple Leafs were remarkably healthy all year, and then lost goalie Frederik Andersen and defensemen Nikita Zaitsev and Roman Polak over the final weekend. The team says Andersen will be OK, but we're not sure on the two blueliners. The big question: What could go wrong? Seriously, it's the Capitals, so history tells us that something terrible will happen eventually, and Washington fans will watch the entire postseason through their fingers waiting for the inevitable. In that sense, the Maple Leafs could make for a classic took-them-too-lightly upset special. More likely, they're the team the Capitals sweep aside easily to make the second-round loss to the Penguins hurt even more. One player to watch: Nylander. Matthews will win the Calder as rookie of the year, and Marner will probably finish in the top five, but Nylander may have been better than both down the stretch. He's got freakish vision that lets him make two or three "how did he see that?" passes per game, and a Kessel-esque release on his wrist shot. He's far from a complete player at this point, and he doesn't have the pure superstar potential that Matthews does, but if anyone's going to have the kind of breakout series that catches some off guard, he could be the guy. Key number: One. That's the total postseasons in Alexander Ovechkin's career in which he's scored more than five goals. (Weirdly, he's scored exactly five goals in five different playoffs.) If the Leafs are missing two of their three defensemen on the right side, Ovechkin may crack that five-goal mark by the second intermission of Game One. Bonus prediction that is oddly specific: The Leafs win Game One in overtime and everyone on both sides of the aisle loses their minds. Then the Caps cruise to four straight blowouts. Never in doubt — right, Leafs fans? Heading into the season’s final weekend, there were a handful of first-round matchups left to be determined. But there was only one playoff spot on the line. And even that one was supposed to be all but locked in, at least according to the oddsmakers. But "in theory" never gets you very far with the Toronto Maple Leafs, which is why Leafs nation wasn't in an especially great mood heading into the weekend. Toronto went into the season's final days needing two points out of two games, and while the standings suggested that matchups with the Penguins and Blue Jackets were tough ones, neither Metro team had anything left to play for. Even a pair of Leafs losses could have been enough, especially if the Lightning and Islanders lost their own games. For most teams, it would be a slam dunk. But again, these are the Leafs, where closing things out has been a bit of an issue over the last, oh, decade or so. And so you could forgive Maple Leafs fans for expecting the worse, and fans of every other team for gleefully waiting for the inevitable collapse. And sure enough, Saturday's showdown with the Penguins went exactly to script. Phil Kessel hadn't scored in forever, but he did against the Leafs, because of course he did. Frederik Andersen got hurt and had to leave the game, because of course he did. The Maple Leafs scored the go-ahead goal into their own net on some sort of soccer set play in the third period, because the ghost of Harold Ballard showing up and flinging the puck into the top corner would have been just a little too on-the-nose. This was every Toronto Maple Leafs game of the salary-cap era all rolled into one. Right up until it wasn't. Not only was Kapanen the key prospect in the Kessel trade, but his father figured prominently in the closing credits of the Maple Leafs' last full-season playoff run. That's how long it's been since the Leafs had a season like this — children are showing up to avenge their ancestors. Then Auston Matthews got his 40th before the final buzzer. And just like that, the Leafs were in. So where does it go from here? Probably not very far, if we're being honest. The Leafs coughed up a golden chance at a very winnable matchup with Ottawa by dropping last night's finale against Columbus. They'll get the Presidents' Trophy–winning Caps instead, and the best thing you could say about that matchup from a Toronto perspective is that they'll get a first-hand look at the sort of team they aspire to be someday. But the team says Andersen should be OK and the Leafs did have some success against Braden Holtby this year, so who knows? It's not like the Capitals haven't endured a playoff collapse or two of their own over the years. The Leafs have already defied the odds to make it this far, so what's a 23-point gap in the standings? Maybe they'll make things interesting. Or maybe not. Chances are, the Leafs will get roughly four games' worth of playoff experience and then call it a season. But that's four more than anyone thought they'd get heading into this season. And it's probably four more than most of their fans thought they'd be getting when Jake Gardiner was punting a potential game-winner into his own net. 5. Columbus Blue Jackets (50-24-8, +54 true goals differential*): They came down the stretch with six straight losses before last night's win, earned just one win against a playoff team since March 2, and get a first-round matchup with the Penguins. It's still been a great season, but if they're going to make any playoff noise, they'll have to earn it. 4. Anaheim Ducks (46-23-13, +23): They needed a late comeback to do it, but last night's win over the Kings clinched top spot in the Pacific and a date with the team they never lose to at home. - But are they bluffing? 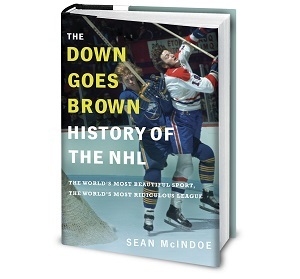 - Is there anything that fans who are tired of the NHL's constant screwups can actually do? - Does the Leafs' playoff push change my opinion about the loser point? - I tell a story about emotionally scarring my children. With less than a week to go before the playoffs start, there remains a good possibility that we’re going to see a series between the Maple Leafs and Senators. That would be a great matchup – one of the best possible – and would feature two underdog teams that few expected to be in the playoffs at all. But more importantly, it would mark the resumption of the Battle of Ontario, the rivalry that dominated the province for a good stretch of the pre-lockout years, and continued to simmer after that even though one of the teams decided not to make the playoffs anymore. It was a great rivalry, one that alternated between dramatic playoff showdowns, legitimate bad blood, and goofy “Wait, did that really just happen?” scenes. But which Battle of Ontario moment is your favourite? And more importantly, what does that choice say about you as a person? Let’s find out, as we run through 12 of the most memorable moments in the rivalry’s history. A rarely acknowledged fact about the Battle of Ontario is that it didn't always involve all that much bad blood. In 2000 and 2001, the two teams hadn't built up much in the way of animosity, and the matchups felt like more a geographic novelty than a real rivalry. Even the two fan bases largely got along. But it's not hard to pinpoint the exact moment that changed. It came in the final minutes of game five of the 2002 matchup between the two teams, with both the game and the series knotted at 2–2. You really couldn't draw up a better playoff controversy. Tucker was a divisive player, beloved as a gritty warrior in Toronto but viewed as a pest and diver by Sens fans. Meanwhile, Alfredsson was considered a virtual saint in Ottawa, but the moment transformed him into the rivalry's arch-villain in the eyes of Leaf fans. Having Alfredsson escape a penalty for drilling Tucker into the boards was near-perfect; having the Senators' captain score the winning goal seconds later was downright diabolical. What it says about you: You are a Senators fan, and there's a 90–per cent chance you remember this moment more fondly than your wedding day or the birth of your children. Domi was front and centre throughout the rivalry's heyday, and normally anything that left him bloodied would be just fine with Ottawa fans. But that wasn't the case in game six of the teams' 2002 second-round matchup, when a hit from behind worked against the Senators just two days after Alfredsson flattened Tucker. The Senators were looking to close out the series on home ice, and had jumped out to an early 2–0 lead that Leafs coach Pat Quinn later admitted had him worried the final might end up being 10–0. Ottawa fans were already breaking out the mocking "goodbye" chant. That's when Persson decided to drill Domi from behind, cutting the Leafs' enforcer and earning a five-minute major. The Leafs scored twice on the power play, and went on to win the game 4–3. The two teams headed back to Toronto, where the Senators went out meekly with a 3–0 loss. The hit led to one of the rivalry's most memorable quotes, when Alfredsson told reporters that they'd be going on to the next round "if Domi had better balance". What it says about you: You're a Leafs fan, and your life goal is to someday meet Domi and personally thank him for not having better balance. When the NHL emerged from the year-long lockout that killed the 2004–05 season, it was with a full slate of 15 opening-night games on Oct. 5, 2005. But only one, featuring the Leafs and Senators in Toronto, went to a shootout, marking the first time in league history that the tie-breaker gimmick made an appearance. Alfredsson got the honours of taking the first shot and scoring the first goal. Three current Hall of Famers were involved in Dominik Hasek, Ed Belfour and Eric Lindros. Dany Heatley ended it by scoring the first-ever shootout winner. And yet somehow, the most memorable moment from the whole thing has become Jason Allison's slow-motion attempt, which is rumoured to still be going on to this day. What it says about you: You still think the shootout is cool. Hi there, Mr. Bettman, thanks for reading. With just days until the end of the regular season, several playoff-bound teams are fading down the stretch. The Sharks have been struggling for a month. The Wild, even longer. The Senators have gone cold over the last two weeks, and the Rangers still don't seem quite right. But does any of that matter? You'd obviously rather win than lose, and the Senators and Sharks still have seeding to worry about. But all four teams are making the playoffs. Once they get there, will going in cold hurt their chances? Not necessarily. NHL history features plenty of examples of teams that seemed like they were heading into the postseason without any momentum, only to flip the switch and go on a long run. So today, let's see if we can calm some nerves around the league with a look back at five examples from the cap era of teams stumbling across the regular season finish line, then doing just fine once the playoffs started. Down the stretch: After a March 13 win over the Blackhawks, the Flyers were comfortably holding down a playoff spot, sitting seven points up on the ninth-place Rangers with 15 games to play. But they dropped a game in MSG the next night, and won just five games the rest of the way. That slump included a five-game losing streak, and saw the Flyers nearly fall out of the playoffs altogether. Only a shootout win over the Rangers on the season's final day earned the Flyers a spot. But then: After backing into the playoffs, not many gave the Flyers much of a shot against the second-seeded Devils. But they pulled off the upset in five, then continued all the way to the final, where the lost to the Blackhawks in the case of the disappearing OT winner. Their Cup dreams may have fallen two games short, but it wasn't a bad run for a team that very nearly slumped their way right out of the playoffs altogether. The NHL is having a rough few months. They just announced that they won’t be going to the Olympics, even though their fans and players want them to. They have franchises in trouble. Everybody seems to be complaining about the playoff format. Their new expansion team just got overshadowed by a bigger league. This year’s playoff race has turned into a bust, with basically all the spots wrapped up before the final weekend. And it’s already sounding like the next lockout is all but inevitable. And believe it or not, none of that comes close to being the league’s biggest problem right now. That’s because the league is facing a major threat in the form of a lawsuit over its handling of concussions. The slow-moving suit has been winding its way through the courts for a few years now, and there’s no immediate end in sight. But some recent developments have pushed it back onto the front page. And it hasn’t been a good look for the NHL. So what exactly is this lawsuit, and what does it mean for the NHL? It’s a complicated issue with a lot of moving parts, but at a high level, this is about former NHL players who say they suffered concussions during their playing days, whether the league and its teams did enough to ensure player safety at the time, and what sort of responsibility (if any) the league should have to those players today. Much of this resolves around a degenerative disease called chronic traumatic encephalopathy, or CTE. Most experts agree that CTE is related to a history of concussions and brain injuries, and can lead to all sorts of symptoms late in life, including dementia, aggression, depression and suicidal thoughts. Some of the stories of former athletes living with symptoms are gut-wrenching. A growing list of former NHL players are suing the league, claiming that they suffered concussions during their careers – in some cases, multiple untreated concussions. Some players claim they’re already experiencing CTE-like problems, while others are concerned that they’ll face them in the future. The list began with 10 players filing suit in 2010; that list quickly grew to over a hundred. The case is now a class action suit, meaning it could include any ex-player who was suffering from concussion-related problems. As often happens, this case has moved slowly. But we recently found out that a judge told the parties last year that she wants the case to go to trial in 2017, in some form or another. We’re down to five days left in the regular season, and it’s starting to look like we could be in for an anticlimactic finish. Most of the playoff spots are spoken for, the individual scoring races are pretty much set, and only one division title is really still in play. But for fans, there’s still something important to keep an eye on: the first-round matchups. Let’s face it: The opening round of the playoffs is pretty much the best time of the entire year, as we get a firehose of high-intensity hockey for two straight weeks. That’s especially true when we get great matchups. So today, let’s look at the best first-round pairings that are still realistically in play. We’ll define “realistic” as 25 per cent or better, using the odds as calculated by Sports Club Stats. Unfortunately, that rules out series like Leafs/Habs or Capitals/Penguins, which will have to wait for round two. But it still leaves us with plenty of potential matchups to get excited about, and we’ll break them down here. Contender status: Excellent on one side, as the Capitals will probably win the Presidents' Trophy. The Bruins, not so much, although there are still some numbers-oriented types who think they're underrated. Rivalry factor: Minimal, although they did meet in the playoffs five years ago in what turned out to be a great series. Potential storylines: With apologies to whoever the Caps end up playing, most of the focus in their opening round will be on Washington. Is this the year they can finally shake off all that baggage and win a Cup? Or is there another heart-breaking collapse right around the corner? Bottom line: None of the potential Capitals matchups really jump out at you; they'll almost certainly end up getting the second wild card, which will be an Atlantic crossover team. That could still make for a decent series, but if you're looking for a can't-miss Capitals matchup, you'll probably have to wait for round two. Random clip to get you fired up: Joel Ward's game-seven winner knocks out the defending-champion Bruins in 2012. If this goal happened today, the replay review for goalie interference would last roughly three days. Contender status: Not bad. The Sharks looked like the Pacific favourite a month ago, but they've been fading ever since. On the other hand, the Oilers are red hot, and have entered sneaky dark-horse territory. Rivalry factor: Minimal. They've met in the playoffs once before, but that was 11 years ago. Potential storylines: This would be the classic matchup between two good teams headed in opposite directions. The Sharks are the valiant veterans, trying to claw their way to one more run at the Cup after falling just short last year. They'd be facing a young Oilers team that'll do plenty of winning over the next decade, but may not be quite ready yet. Given where each team is at, the sight of a baby-faced Connor McDavid taking the opening faceoff against Joe Thornton's anthropomorphic beard might be a little too on-the-nose. On top of that, there's also the Todd McLellan factor, as the Oilers coach would be facing the team that fired him in 2015. Bottom line: Remember in the 1980s, when the young Oilers had to face the grizzled Islanders to truly learn what it took to win a Stanley Cup? This would be like a watered-down reboot of that concept. Random clip to get you fired up: Like all great rivalries, this one features a Mike Vernon fight. Sort of. OK, not really. Like I said, the history here isn't all that rich, so we take what we can get. One week. That’s all that’s left in the 2016–17 regular season. And with a busy seven days ahead that will see some teams playing as many as five times, it feels like the big picture is starting to come into focus. We don’t have all the answers yet, but we’re getting there. Out West, the Blackhawks have wrapped up the top seed. The slumping Wild will almost certainly limp into second in the Central, giving them home ice in the first round. And with the Kings officially eliminated last night, we know who the eight playoff teams will be. In the East, we can pretty much pencil in the Habs as the Atlantic winner, which also means we can go ahead and book them into a first-round matchup with the wild-card Rangers. (They may also finish with more points than New York after all, which should take some of the heat off of the playoff format.) The Capitals have a stranglehold on the Metro after last night's win in Columbus, and that means a first-round showdown between the Blue Jackets and Penguins. And while we're not there quite yet, we're getting dangerously close to being able to say that we know that the Maple Leafs are going to the playoffs. After last week's brief bout of Frederik Andersen panic, the Leafs won three straight and got their goalie back, and even briefly moved into second place in the Atlantic. The Senators look reasonably safe, too, although maybe slightly less so than Toronto given their recent struggles and injury issues. And the Bruins got a huge win yesterday in Chicago, giving them five straight and bumping them past Toronto and Ottawa into second place (although both those teams have two games in hand). If the Leafs, Senators and Bruins are all in, that leaves all of the Eastern spots accounted for, freezing out the Lightning, Islanders and Hurricanes. All three of those teams are still technically alive, but each would need to virtually run the table in the final week and get help from elsewhere. At the other end of the standings, we know the Avalanche will have the best odds in the lottery, and that the Golden Knights will slot in at No. 3. The two-spot is still up for grabs, with the Coyotes at risk of losing their grip after last night's win. As far as individual honours go, Connor McDavid has all but clinched the Art Ross, and Sidney Crosby is closing in on doing the same for the Richard. Auston Matthew hasn't quite wrapped up the rookie goals and points title, but Patrik Laine will need a big game or two to close the gap there, and Erik Karlsson's injury may have closed the door on catching Brent Burns in the blueline points race. So that's what we know, or are reasonably close to knowing. What's still up in the air this week are most of the first-round matchups, including whether we'll get new chapters in the Battles of Alberta and Ontario. Home ice in the various two-vs.-three pairings is still a question mark everywhere outside of the Central. The top of the Pacific is a mess. And we still don't know who'll win the Presidents' Trophy, or whether they'll remember to pretend that they care. With that, let's move on to the power rankings. Last week, we couldn't find anyone who seemed like a good pick at the number five spot, so we settled on the Canadiens almost as a placeholder. Did anyone else do enough to jump up and grab that spot this week? 5. Edmonton Oilers (44-25-9, +32 true goals differential*): Huh. Well then. Let's discuss further down below. 4. Columbus Blue Jackets (49-21-8, +59): They've lost five of seven, including two against the Caps and one against the Blackhawks. For a team that can still be hard to picture as truly elite, that hurts.